Celebrate the 2016 Lunar Festival in the Nexus! February in Heroes of the Storm will be fully dedicated to the 2016 Lunar Festival event. The Lunar Festival is the equivalent of the Chinese or Lunar New Year celebrations in the Blizzard universe. It has been a well known world event in World of Warcraft and, this time, it lands in Heroes of the Storm as well! Let's see what awaits us in the Nexus for the next month. At the start of each year, denizens of Azeroth take time to cherish the wisdom of their elders, and remember a great triumph over an ancient evil. Those who now reside within the Nexus have brought these traditions along, and you can help ring in the new year by joining in our brand-new Lunar Festival event. Lunar Festival 2016 will include new Special Event quests and rewards, new and returning items in the Shop, and you may even catch a few fireworks at the end of your games! The revelry will last from Tuesday, February 2 through Tuesday, March 1, so be sure to complete your quests and pick up a few items in the Shop before the Lunar Festival concludes! 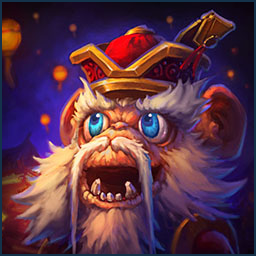 Complete 25 games in Versus A.I., Quick Match, or Ranked play during the Lunar Festival 2016 event and you’ll earn the brand new Monkey Elder holiday portrait! Each day during this year’s Lunar Festival event, you’ll receive a Special Event quest to catch the Monkey Elder. This curious creature will have a 50% chance to spawn at the start of your games if any players on your team have not yet finished this quest for the day, but when the Monkey Elder does appear, he’ll lead you on quite a chase! You must work together with your teammates to slow and eventually catch the Monkey Elder, who will drop a Red Envelope that awards 100 gold to each ally with an active Monkey Elder Special Event quest. As part of our celebration for the new year, we’ve also added new hero skins, a pair of Lunar Festival bundles, and a brand new mount to the in-game Shop. If you’re eyeing one of the bundles, then be sure to move quickly, because they’ll only be available during our Lunar Festival event! We hope you’ll join us in celebrating the Lunar Festival this year, and don’t forget to help your teammates catch those Elder Monkeys, because you just might need their help in the future! Until next time, we’ll see you in the Nexus. The looks for the new Jaina and Illidan skins, as well as the new mount, have been datamined by Heroes Nexus. We will be covering all the datamined features in a future article. Until next time!